Ten former Notre Dame Fighting Irish football players will continue their professional careers in the Alliance of American Football, which kicks off its inaugural season Feb. 9. The AAF is the brainchild of Charlie Ebersol ’05 and Bill Polian, NFL Hall of Fame member and father of current Irish special teams coach Brian Polian. The league has positioned itself as a “second chance” for players still harboring NFL ambitions, while also trying to reinvent the way football is played and broadcast. There will be a 30-second play clock, fewer replays than the NFL and no extra points or kickoffs. Telecasts — including those on CBS and CBS Sports Network — will eschew “TV timeouts” and have 60 percent fewer commercials than the NFL, league officials say. There’s also a post-football draw for the players, according to the Washington Post. #26 RB Tarean Folston, who played for the Irish from 2013 to 2016. Folston could have played a fifth year somewhere, but opted to try his luck with the NFL instead. He had a tryout with Washington, but it didn’t materialize into anything. #14 WR Malachi Jones, the younger brother of TJ Jones, a Detroit Lions wide receiver who played for the Irish from 2010-2013. 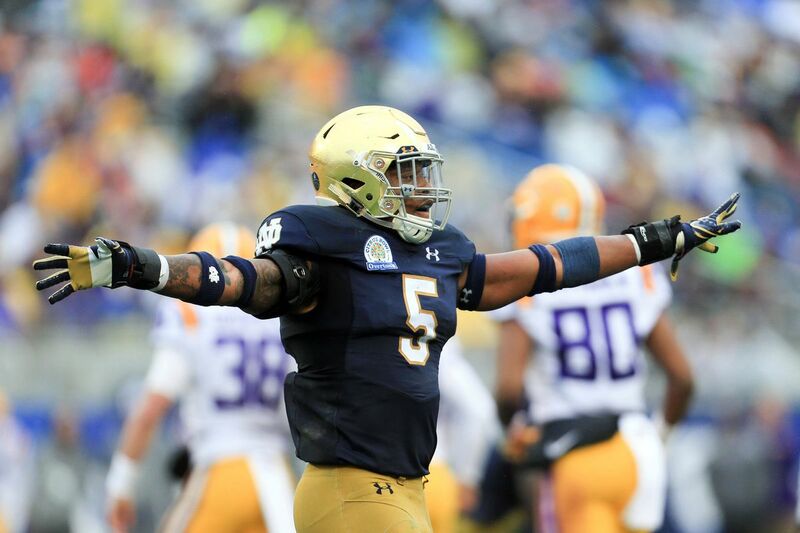 #55 LB Nyles Morgan, who played for the Irish from 2014 to 2017. Morgan was waived by the Chicago Bears after rookie minicamp, then played 10 days for the Tennessee Titansbefore being waived on cutdown day. #80 TE Joseph Fauria, who was on the Irish’s 2008 team. He was suspended in June 2009 for a season for “personal reasons” (or, “violation of team rules”) and transferred to UCLA. He played 23 games with the Detroit Lions in 2013 and 2014, catching 24 passes (eight for touchdowns). #19 WR Amir Carlisle, who played for the Irish from 2013 to 2015. Carlisle transferred from the USC Trojans after his freshman season. Carlisle signed with the Arizona Cardinals as a undrafted free agent, but was cut before the 2016 season started. He’s spent time with both the B.C. Lions and Montreal Alouettes of the Canadian Football League, but hasn’t been on a team since last June. #20 DB Max Redfield, who played for the Irish from 2013 to 2015. Redfield’s Notre Dame time came to abrupt end after he was charged with possessing a loaded handgun following an August 2016 traffic stop, but he did finish the requirements to earn a bachelor of arts degree in 2018. Redfield played at Indiana University of Pennsylvania as a graduate transfer and also spent time with the Alouettes. #20 DB Cody Riggs, a graduate transfer from the Florida Gators who played for the Irish in 2014. Riggs signed with the Titans as an undrafted free agent and made the roster. He joined the Tampa Bay Buccaneers as a practice squad member in 2017, but was later waived. #1 P Ben Turk, who kicked for the Irish from 2009 to 2012. Turk signed a “futures” deal with the New York Jets last January, but was waived by the team before final cutdowns in August. #45 LB Greer Martini, who played for the Irish from 2014 to 2017 and was a team captain. Martini signed with the Green Bay Packers after impressing at a rookie minicamp and was on the team’s practice squad until October. He then tried out for the Cleveland Browns, New Orleans Saints, Denver Broncos and Indianapolis Colts, but to no avail. #49 LS Scott Daly, who snapped for the Irish from 2013 to 2016. Daly had a rookie minicamp tryout with the Bears and was a member of the Dallas Cowboys from April to September of last year. #60 OT John Montelus, who played for the Irish from 2014 to 2016. He then spent a graduate year with the Virginia Cavaliers, before signing as an undrafted free agent with the Lions. The Lions cut him on Sept. 1, when trimming their roster to 53 players. This post originally appeared on onefootdown.com. Copyright 2019.